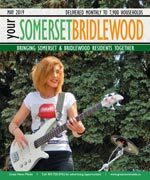 The Somerset and Bridlewood community association currently lacks a community center but remains active in programming. The grand historic Shawnessey Barn is used for community dances. The community also enjoys an excellent relationship with nearby Spruce Meadows and often makes use of their facilities for special events such as Canada Day celebrations. The community is also closely tiers with neighboring Midnapore, where children can register for sports. Also in Midnapore is the new South Fish Creek recreation center, which offers a variety of recreational opportunities. Baseball diamonds and a waterpark can also be found in Somerset. The community association also works to address issues such as traffic concerns and is a member of the South Fish Creek Transportation Action Committee. In the City of Calgary's 2012 municipal census, Bridlewood had a population of 11,835 living in 4,200 dwellings, a 1.7% increase from its 2011 population of 11,641. With a land area of 3.2 km2 (1.2 sq mi), it had a population density of 3,700/km2 (9,580/sq mi) in 2012. Residents in this community had a median household income of $70,477 in 2000, and there were 6.2% low income residents living in the neighborhood. As of 2000, 15.9% of the residents were immigrants. All buildings were single-family detached homes, and 4.3% of the housing was used for renting. For more detailed info visit the City of Calgary community profiles site.